Get ready for gameday by adding some flair to your fan cave! With the help of PersonalizedThings by Exposures, finding custom MLB sports decor has never been so easy. 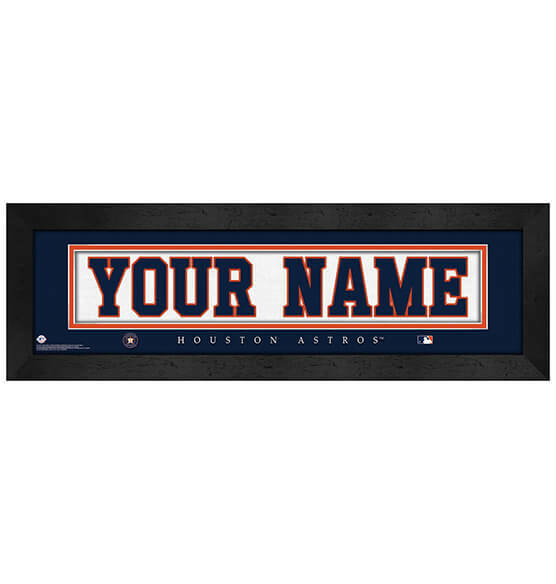 Our Houston Astros MLB Personalized Nameplate is a home run for Astros fans with its sleek black frame, vibrant team colors and crisp logos. Customize this sports decor quickly and easily to specify the name you want to appear on this made-to-order printed artwork up to 12 characters. It comes ready to hang with a convenient sawtooth hanger. So, break out the peanuts, Cracker Jack and your favorite cold beverage. With our personalized Houston Astros merch, you'll be all set with team spirit!